The proposed Poets Plaza in North Beach. North Beach may be famed for its resident's beautiful word but the historic San Francisco neighborhood is struggling to build a memorial to immortalize them. 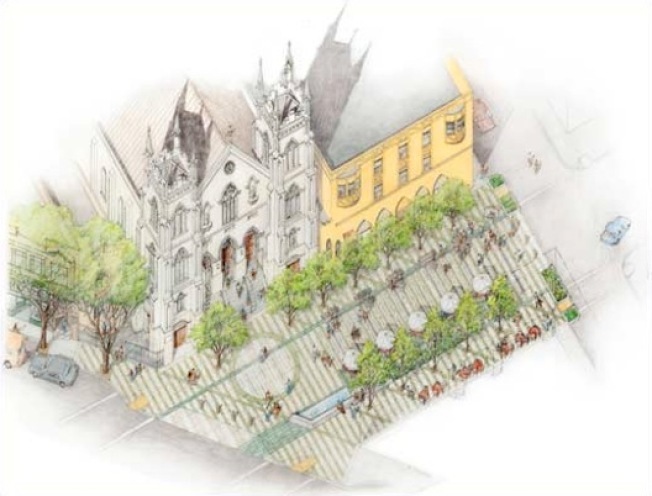 The community designed Poets Plaza was suppose to close off a block of Vallejo Street near Caffe Trieste for a grand memorial to the likes of Allen Ginsberg. But the non-profit group behind the three-year-old project has to dig itself out of a financial hole before the plan can move forward. The Piazza Saint Francis Association owes more than $22,000 to engineering firms, according to the San Francisco Examiner. And the project can't move forward until the debt is paid. Lawrence Ferlinghetti, who co-founded City Lights Booksellers and Publishers and the project, said the group needs to raise more than $2 million to see the project come to fruition. But the hefty price tag is not silencing advocates of Poets Plaza. Ferlinghetti said he hopes to raise the money through donations: Give money, get your name engraved somewhere in the plaza. Mayor Gavin Newsom might be the first person they want to hit up for some change. He is reportedly an avid supporter of the project.